I’ve helped staff the WordPress booth at the Online News Association over the last four years. It’s my favorite conference to attend because of all the incredible people we meet: students who learned to code because of WordPress, journalists who built their first portfolios on WordPress, newsrooms that were transformed by WordPress. Like many ONA attendees, I also built my first website on WordPress in journalism school. I worked at the Chicago Tribune as the newsroom was being transformed by blogs. And like so many of the folks I spoke with last week, in 2012 I too walked up to a WordPress booth at a conference to share my story of how WordPress had changed my life. Little did I know I’d end up joining the VIP team, helping newsrooms transition to WordPress one-by-one. Pete Schiebel, Jeff Bradley, Matthew Denton, David Artiss, Chris Scott, and Steph Yiu at the WordPress.com VIP booth. ONA is a massive conference. More than 3,000 people attended this year in Washington, D.C. I knew I’d run into lots of clients and partners, and this year, I was interested in hearing in their words how they reflect on WordPress and its role in their professional lives. So I asked them. On the first day I saw Zach Seward, SVP of Product and Executive Editor at their gathering to promote Quackbot, their new Slack bot. Quartz’s WordPress launch was one of the early projects I worked on when I joined VIP. “Honestly, to this day, there’s not a project or need that we haven’t been able to do with WordPress,” he said. High-volume newsrooms love WordPress because of how easy it is for their teams to publish. This year, we co-hosted with our partners Alley Interactive and Parse.ly at the delicious Lapis restaurant in D.C.’s Adams Morgan neighborhood. This was a topic of dinner conversation at my table – how critical time to publish is in a breaking news situation, and how easily WordPress facilitates that. At dinner I ran into Patrick Tolbert, Digital Director at KXAN-TV, who helped introduce WordPress to his newsroom. At the WordPress booth the next day, Emma Carew Grovum stopped by to say hi. She helped Foreign Policy move onto WordPress, and today she is the CMS product manager at The Daily Beast. She credits WordPress for teaching her about content management systems – and I asked her what she liked the most. I was also curious what our clients were taking back to their newsrooms after this year’s ONA. What’s next? I had to ask Juan Muñoz, Interactive Director at CNN en Español, who helped put their social and mobile storytelling teams on wheels. At our booth, I also had the pleasure of meeting Amy Claire Nelson, an audiovisual storyteller. More reading on ONA? The Nieman Journalism Lab has a terrific roundup. Looking for more events? We’ll be sponsoring and participating in Digital Media North America later this week, in New York October 19-20 (full schedule). Just after Digital Media NA, WordCamp NYC is October 21-22 (tickets are still available!). Topics of interest to the enterprise include 10up CEO John Eckman’s talk on Personalization and WordPress and TinyMCE CEO Andrew Roberts’ Gutenberg update (full schedule). One of my favorite things about working for the VIP team is the incredible community of clients, agencies, partners, and core contributors I get to work with every day. It’s a powerful and thoughtful group. When a bunch of us get together to address shared challenges, it’s especially rewarding and always memorable. Over the last year, I’ve been collaborating with a group of publishers passionate about WordPress and open source to put together the first-ever WordCamp for Publishers. It was an incredible 3-days focused in the beautiful Denver Post building, thanks to VIP client Digital First Media. Jake Goldman, president of 10up (a VIP partner agency) presented on the changing distribution channels for publishers, and how WordPress can remain the hub in an evolving ecosystem. Both Rebekah Monson, co-founder of WhereBy.Us, and Jake Spurlock, software engineer at WIRED, highlighted the importance of capturing emails and sending newsletters as a key way of making revenue. Both Meagan Kelleher Ball from Tribune Broadcasting (a VIP client) and Kevin Koehler from Automattic shared tips on how to help a newsroom get acquainted to WordPress. Will Davis from The New York Times (a VIP client) and Meagan also led a packed session on editorial dashboards. Between lunch at the food trucks at Civic Center Park, the brewery tour at Ratio Brewing, and the after party at Wynkoop Brewing, WordCamp for Publishers was packed with activities that encouraged our attendees to get to know the beautiful city and each other. We hosted a number of hands-on workshops to help attendees learn tools to make their day-to-day lives easier Tools that were introduced included wp-cli (a command line interface for WordPress), WPGraphQL (a query language for your WordPress API), VoiceWP (create voice apps for WordPress content), and Largo + plugins (a news framework for WordPress sites). Stoked for #wcpub! Time to finish up my lightning talk on ‘Voice Apps for Publishers’. Alexa, write my lightning talk. We ended the conference at a Rockies game on Saturday, and as all the organizers gathered we began talking about next year’s conference. Planning is already underway, so if you’re interested in volunteering or have a venue you think you could donate, please get in touch with me! A special shout out to the organizers, we could not have done this without you! From left: Aram Zucker-Sharff (Salon), Christie Wright (Automattic), Adam Schweigert (Mother Jones), Ryan Kanner (Digital First Media), Taylor Hansen (Linchpin), Matt Johnson (Alley Interactive), Davis Shaver (Alley Interactive), Chris Hardie (Automattic), Alexis Kulash (Automattic), Bradford Campeau-Laurion (Alley Interactive), Jared Cobb (Alley Interactive), Aaron Jorbin (Some Spider), Ben Keith (Institute of Nonprofit News), along with Hughie Devore and Jason Bahl (Digital First Media, not pictured). I am so proud to share that WordPress.com VIP was a sponsor at this year’s ONA Women’s Leadership Accelerator at USC. This was our second year supporting the program, and my second year spending time there. We’re proud to help make the program completely tuition-free for the participants. WLA is a weeklong forum aimed at developing strong leadership skills for women working in digital journalism. Twenty-five women were chosen from 350 applicants to spend a week developing leadership and management skills. Speakers included Kara Swisher, Recode co-founder; Liz Heron, former Huffington Post executive editor; and Charo Henriquez, former executive editor of People En Espanol. By sheer coincidence, my former boss from the Chicago Tribune was this year’s facilitator. Tran Ha, the former Editor and General Manager of the RedEye, was my first manager out of college. Both last year and this year, I got to sit in the back of the classroom as the facilitator coached attendees on problem-solving in the workplace with real-life examples. The very candid discussions about the difficult parts of leaderships allowed women to connect with each other – and hopefully build a support network to help each other throughout their careers. It was also terrific to see many VIP clients represented: The Atlantic, The New York Times, CNN, Bloomberg, and FiveThirtyEight. Tran asked me to participate as a mentor, and I spent the afternoon working with four women, from AJ+, NPR, The Guardian, and Vice. The topics we worked on together included hiring and leading a remote team, project managing engineers, and how to innovate within a busy daily news cycle. Later that evening, I gave a two-part presentation at dinner. For the first part, I talked about the open-source ethos that powers WordPress. Earlier in my career, I worked in newsrooms and used WordPress daily. Back then I knew the software and dashboard very well, but didn’t know the mission behind it all: to democratize publishing. I wanted the help the leaders of newsrooms understand why supporting open source is so important. For the second part, I talked about transitioning from a fairly gender-balanced workplace in editorial, to a mostly-male workplace at the intersection of journalism and technology about five years ago. I talked about the challenges of imposter syndrome and making your voice heard when you’re a minority, and reminded the women in the room that they are an important change in the wave of diversity in leadership at journalism and tech companies. I’m thrilled that VIP was a part of this event for the second year in a row, and I’m looking forward to seeing these women excel across the industry! For more reading, you can keep an eye on the rising stars here. If you’re interested in learning more about women leaders the digital media space, definitely check out Katie Hawkins-Garr’s newsletter from the The Poynter Institute. It’s an incredible read and a great way to find out about amazing things women are doing in journalism and technology. At a BigWP meetup at the New York Post, Bradford Campeau-Laurion from Alley Interactive talked about building the Apple News WordPress plugin for the New York Post. At a Hacks/Hackers + BigWP meetup at the Comcast Center, Karissa Demi from the City of Philadelphia talks about building alpha.phila.gov on WordPress. At a BigWP meetup at the New York Post, Roger Theriault, Sagar Sood, Steve McNally from Hearst presented on creating a contributor network in WordPress. You can view their slides here. At a Hacks/Hackers + BigWP meetup at the Comcast Center, Jonathan Finnegan from Local Media Development presents on creating a community publishing and curation platform on WP multisite. At a recent Hacks/Hackers + BigWP meetup at the Comcast Center, Brian James Kirk and Cary Betagole presented on how Technically Media built their publishing tech stack. At a BigWP meetup at The New York Times, Jonathan Wold from XWP talks about growing his agency’s WordPress team. You can view Jonathan’s slides here. At a BigWP meetup at The New York Times, Jeff Sternberg from the New York Observer talks about shifting their print production workflow from a legacy CMS to WordPress. At a BigWP meetup at The New York Times, Matt Johnson from Alley Interactive spoke about wrangling massive migrations, and shared the architectural thinking behind his team’s migration toolkit. At a BigWP meetup at The New York Times, Paul Schreiber from FiveThirtyEight talks about the importance of moving websites over to HTTPS. Join the WordPress.com VIP team! At WordPress.com VIP, we provide support, hosting, training, and other services to some of the biggest and best WordPress sites on the web. Our business is growing, and so is our team. We’re hiring for three positions: Technical Account Engineer, Business Engineer, and VIP Wrangler. You love working with some of the most influential companies on the planet, and helping them get the most out of WordPress and our VIP program. You’re an amazing communicator, comfortable with a customer-facing role and dealing with a high volume of communication. You’re comfortable in high stakes situations, and are quick to resolve unexpected challenges. Think that sounds like you? Apply now. At the end of the month, we welcomed both The Bloggess and Grantland to the VIP network. During the Sochi Winter Games, we were proud to host the Canadian Olympic Team’s official site. We launched the newly-designed Time.com on WordPress.com VIP while gathered around a table during our annual team meetup. We were excited to see Nate Silver’s FiveThirtyEight.com launch on VIP. We hosted our very first European Big Media & Enterprise WordPress Meetup in London! Over the course of the year we’ve hosted nine Big Media & Enterprise WordPress meetups in five different cities: New York, London, San Francisco, Boston, and Toronto, featuring flash talks by USA Today, GlobalNews.ca, TechCrunch, Harvard Business Review, Metro UK, Forbes, PMC, and NESN. In addition to hosting the TED 2014 conference blog, we welcomed ideas.ted.com to WordPress.com VIP. As our team watched the 2014 FIFA World Cup, we were thrilled to be a part of USA Today and Fusion’s soccer football coverage. We were also happy to welcome Fortune.com, Alaska Airlines, and American Eagle Outfitters to the VIP family. The Meredith Vieira Show launched on VIP. 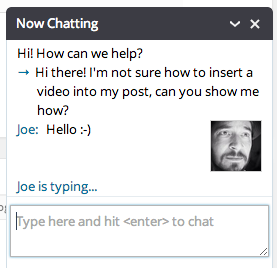 We introduced in-dashboard live chat support for the 22,000 editors, authors, and contributors across the VIP network. Our team is on stand-by to assist users and help them get their work done more efficiently. Robin Williams’ death was covered by almost every news site in the VIP network, with more than 221 million pageviews over a span of roughly 48 hours. Quartz introduced a redesign and launched a homepage for the first time, and blog.wikimedia.org migrated their site onto VIP. We welcomed Fusion.net, a joint venture between Disney/ABC and Univision, onto WordPress.com VIP. We geared up for another set of our VIP Training Days events around the United States – these 1-day courses bring VIP training to a city near you, whether it’s the Superuser, Developer Fundamentals I, or Developer Fundamentals Site Security & Debugging courses you’re interested in. Also in November, Taylor Swift sold 1.2 million albums during her release week and pulled her music from Spotify. Spotify’s CEO posted a response on their VIP-hosted site. And finally, we were thrilled to welcome Code For The People to our team, and in true VIP style, celebrated the announcement together in Lisbon, Portugal. We are excited to welcome Foreign Policy, which launched on VIP this month. As people look back on the year, they are choosing WordPress.com VIP to do so: Time.com’s Person of the Year and Facebook’s Year in Review were both announced on VIP. 2014 was a huge year for WordPress.com VIP, thank you for being a part of it. We’re looking forward to an even bigger 2015! Looking to learn more about WordPress.com VIP? Take a look at our services, our featured partners, or job openings. Our company Automattic — which runs WordPress.com, Akismet, VaultPress, and many other services — is looking for a few stellar summer student interns, specifically to work with us on the WordPress.com VIP team. WordPress.com VIP provides hosting and support for high-profile, high-traffic WordPress sites, including Time.com, FiveThirtyEight.com, qz.com, TechCrunch.com, Observer.com, GigaOM.com, etc. Development Intern: This internship is all about making things. You’ll likely be working on WordPress plugins for large media companies, or working on core WordPress.com features and development. Communications Intern: This internship is all about improving client communications. You’ll likely be writing case studies, interviews, launch posts and new feature posts for the VIP News site, in addition to helping organize our fall events. Where will you be working you may ask? Anywhere! We are a distributed company and are happy if you work from wherever you are — as long as you have a good broadband connection. The internship runs 8-10 weeks between June 1st and August 1st, 2014, but we are flexible on the dates. Interested? Write up a post on your WordPress blog and leave a comment on this post with a link to it telling us what you’ve done and what you’d like to work on — for example, a killer plugin or integration, a feature improvement, a case study, etc. It’s OK if you’d like to keep your post private; your comment and link will remain private to the VIP team as well. Send in your internship application by May 1st, but the earlier, the better. If you have any questions, please leave a comment and we’ll get back to you! We’re excited to announce that Chicago-based online music publication Consequence of Sound launched on WordPress.com VIP today. To build this beautifully responsive site, Consequence of Sound teamed up with WordPress.com VIP Featured Partner Doejo. The Consequence of Sound team is planning on rolling out new features in the coming weeks, including the ability to personalize the homepage. We’re excited to bring such a beautiful and dynamic site onto WordPress.com VIP. Congrats again to the team! Shortly before the holiday break, Taylor Buley of Parade.com presented at the Big Media WordPress Meetup on how his team uses the theme customizer to make editorial changes on the fly. Take a look at his slides or watch his entire presentation below. To see presentations from previous Big Media WordPress Meetups, click here. The first WordPress.com VIP launch of 2014 goes to Re/code, a new venture by Walt Mossberg and Kara Swisher. The site is also home to Revere Digital’s new conference series, The Code Conference. We’re thrilled to celebrate the New Year by welcoming Recode.net to the WordPress.com VIP family. Congratulations! Want more information about WordPress services for your enterprise or publishing site? Get in touch. We’re continuing to post presentations from our recent WordPress Big Media Meetup in New York City. Today, a presentation on Redefining Traditional Media Workflows by Helen Hou-Sandi from 10up. Our apologies, we are missing the first minute of the presentation due to technical difficulties. To see the presentations from previous Big Media WordPress Meetups, click here. We’re continuing to post the presentations from our recent WordPress Big Media Meetup in New York City. Today, a presentation and discussion on Code Review, lead by Mo Jangda from WordPress.com VIP. A huge thank you to everyone who attended our WordPress Big Media Meetup last Thursday, hosted at the Thunderdome HQ in New York City. Over the next few weeks we’ll be posting each of the talks. For the first installment, here are the slides and video from Connor Jenning’s presentation. To see the talks from the previous Big Media WordPress Meetups, click here. We wanted to take a moment to celebrate teams in the WordPress.com VIP community who have recently been recognized in Editor & Publisher’s 18th Annual EPPY awards. We’d also like to congratulate our Featured Partner 10up, who completed the development work on GlobalNews.ca. We’re delighted to be working with teams and websites that are being recognized for their excellence in smart design and high-quality content. Andrew Nacin is one of the lead developers of WordPress. At our August Big Media Meetup, he gave a short “flash talk” on how WordPress evolves while maintaining backwards compatibility — here’s a video from the event. Interested in coming to a future event? Be sure to join our Big Media WordPress Meetup group. Josh Kadis is the web applications technologist at Quartz. At our August Big Media Meetup, he gave a short “flash talk” on building qz.com on WordPress, which we’ve shared here. Quartz just celebrated its one-year anniversary, and you can learn more about it by reading our case study here. Austin Smith is a managing partner at Alley Interactive, a VIP Featured Partner Agency. At our August Big Media Meetup, he gave a short “flash talk” on Elastic Search on WordPress.com, which we’ve shared here. You can read more about the VIP Search Add-On here, and see it in action at KFF.org. A huge thank you to everyone who took the time to attend the Big Media WordPress Meetup at The New York Times Building in August! It was a huge success. The event featured 10-minute “flash talks” by Scott Taylor (The New York Times), Austin Smith (Alley Interactive), Josh Kadis (Quartz), and Andrew Nacin (WordPress), followed by breakout discussion groups. If you’re interested in coming to future events, be sure to join our “Big Media” WordPress Meetup Group. In the next few days we’ll be sharing video from each of these talks. Today, here’s Scott Taylor’s presentation on “The Future of Blogs Development at The New York Times,” where he discusses how the NYT’s WordPress blogs fit in with the larger site-wide redesign.